A blistering late charge by David García Dapena earned the 30-year-old a lone win on stage 15 of the Tour of Spain. Overall, Alberto Contador crashed mid-stage, scraping his left shoulder and knee, but continues as race leader. For Xacobeo-Galicia, one of the smallest teams in this year?s Vuelta – with a total budget of around 2.5 million euros – their first ever stage win in their home race represents the highest of high points in the squad?s short history. Garcia Dapena?s win comes hard on the heels, too, of the announcement that the team’s main sponsor – the local government of Galicia – will continue to back the squad through 2009. Quite apart from being good news for the Galician squad, there was a sort of poetic justice in Garcia Dapena?s victory as well. On Sunday?s ascent of the Fuentes de Invierno, Xacobeo-Galicia leader Ezequiel Mosquera had dropped the entire field barring Contador and Leipheimer. 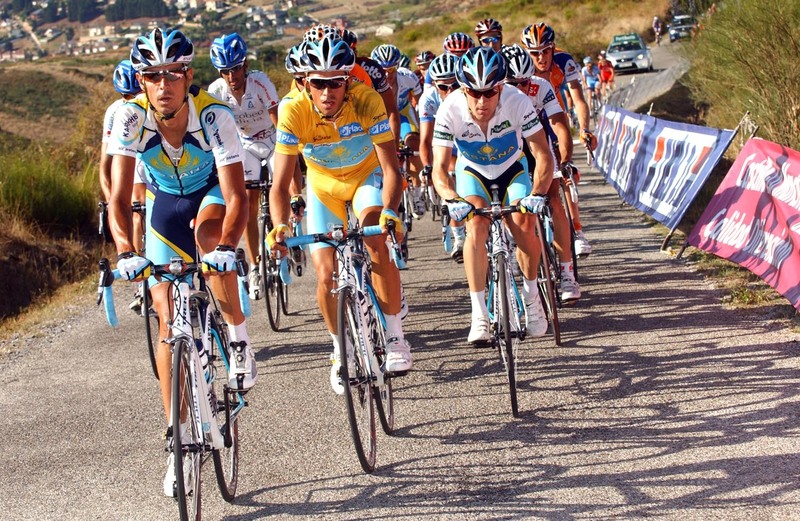 Contador refused to work with Mosquera – although for some it was both riders? interest for him to do so – then attacked in the last two kilometres for his second win in two days. Xacobeo manager Alvaro Pino strongly criticised Contador and Astana for their lack of collaboration, and the very public Astana-Xacobeo spat was the talking point of the race on Monday. Stage 15, though, was another story. Garcia Dapena was part of a break of 17 that went clear early on the hilly 200 kilometre stage. With 15 minutes on the main bunch by the time the move reached a final unclassified climb of Lombillo outside the finish town of Ponferrada, one of the riders in the break was going to be cracking open the champagne that evening. A powerful charge by Spanish Classics specialist Juan Manuel Garate (Quick Step) on the Lombillo, far steeper and longer than it appeared in the route book, split the break completely. Garate was brought back just before the break-neck descent back down into Ponferrada by the three strongest riders in the move: former Tour of Britain winner and Flanders 2008 runner-up Nick Nuyens (Cofidis), Spaniard David Arroyo (Caisse D?Epargne) and Garcia Dapena – best known for his overall win in the Tour of Turkey this spring. In a tense finale that had all the suspense of a minor Classic rather than a transition stage on the Tour of Spain, none of the four really seemed to have the edge on their rivals. Arroyo put in two massive attacks, and both were brought back. Then though one-day specialist Nuyens made a textbook counter-move as soon as Arroyo was caught, the wily Belgian was also reeled in with three kilometres to the finish. That was the signal for Garcia to launch his first attack and the 30-year-old Spaniard made it count, opening up a 15 second margin on the high-speed finale. A few minutes later, the Xacobeo-Galicia was able to cross the finishing line alone and with his arms in the air: a well-deserved win at the end one of the most exciting stages of the Vuelta.